Accountability, teamwork, character, service excellence and personal growth are at the heart of everything we do at Maine Pointe. We are committed to building a company that is sustainable, not only financially, but also socially and environmentally. We reflect this commitment in the way we work with our employees, contractors and clients and in terms of how we contribute to the wider community and the world around us. Our corporate social responsibility program highlights the work Maine Pointe already does and provides us with a framework for our future development to ensure that we continue to uphold our values and to do the right, honest and ethical thing at all times. We pursue individual excellence and success, and strive to achieve a balance among health, family, spiritual and professional goals. We are committed to conducting our business at the highest standard, providing a high level of service and customised solutions that exceed client expectations, whilst having a positive social and environmental impact across our global footprint. We work alongside our clients to reduce the environmental impact of their business and build a better, more sustainable future. For example, we helped the aviation division of a large energy company to achieve a reduction in carbon emissions equivalent to 2,173 passenger vehicles being taken off the road. Smile Train – In 2016, Maine Pointe raised $60,200 for Smile Train, an international children's charity with a sustainable approach to a single, solvable problem: cleft lip and palate. Smile Train provides training, funding and resources to empower local doctors in 85+ developing countries to provide 100% free cleft repair surgery and comprehensive cleft care in their own communities. Click here to read the full story. PMC (Pan Mass Challenge) – Each year the Pan-Mass Challenge brings together thousands of impassioned cyclists, committed volunteers, generous donors and dedicated corporate sponsors to raise funds to provide Dana-Farber Cancer Institute's doctors and researchers with the necessary resources to discover cures for all types of cancer. Maine Pointe, along with our sponsors, has raised over $200,000 for this very deserving cause over the last 10 years and was a major sponsor of the event in 2015. Divine Water– Founded three years ago by Maine Pointe's, Jim Mynaugh, Divine Water was created to provide access to safe, clean, reliable drinking water for communities that lack this most basic resource. The two water wells in Haiti and six in Uganda that the charity has already built will have a significant impact on the lives of adults and children for generations to come. 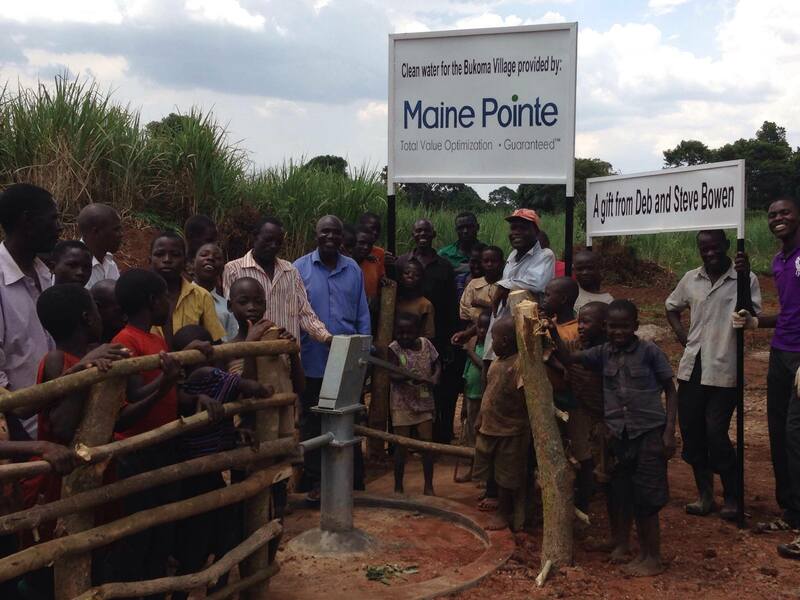 Maine Pointe sponsored the provision of a new water well for the village of Bukoma in Uganda. Click here to read the full story. Kibo Group also tells the story of just one of the 4,500 villagers whose lives have been impacted by the new well. 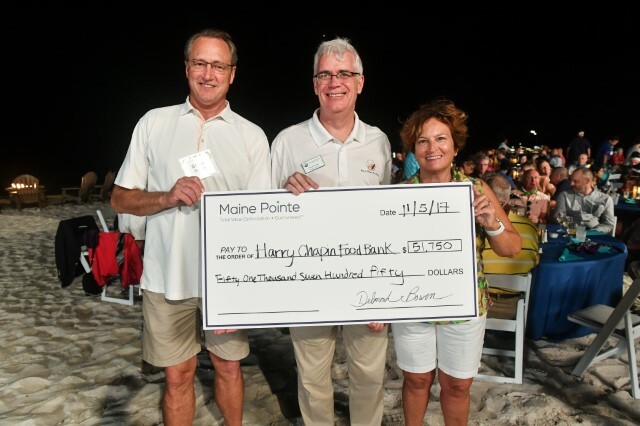 The Harry Chapin Food Bank - Maine Pointe raised $51,750 for The Harry Chapin Food Bank during our annual meeting in Naples, Florida in November 2017. Founded in 1983, Harry Chapin is the only Feeding America food bank in the southwest Florida region. The organization is partnered with more than 150 agencies that provide direct services to those in need, including church food pantries, soup kitchens, emergency shelters, disaster relief agencies and more. The food bank provides food for about 28,000 individuals each week. Click here to learn more.